Prairie View Golf Club in Carmel is an outstanding golf facility - completely deserving of its 4 1/2 star rating from Golf Digest Places to Play. Located on 206 acres in Hamilton County, this Robert Trent Jones layout features 18 meticulously groomed holes sculpted from a rolling prairie, with towering oaks and sycamores characterizing the site which is situated along the banks of the White River. The conditioning from tee to green is among the best we have encountered in Indiana! Rated by readers of Great Lakes Golf Magazine, the course has won accolades in Best Course, Best Par Three, Most Beautiful and other categories. Upon opening in 1997, Prairie View was honored as one of the top ten new upscale public courses in the country by Golf Digest. Manicured fairways bordered by tall native grasses, large mildly undulating greens, plentiful white sand bunkering, and beautiful water hazards make this course visibly enticing. Natural wetlands, 5 serene lakes and a clear running stream that runs through the property add to the aesthetics and challenge of one of the top courses in the state. The facility is replete with amenities that include the state's largest bent grass range, short game area with sand bunker plus large putting green. The clubhouse has a 1,500 square foot pro shop with golf attire, clubs and accessories, plus the Albatross Grill and lounge that doubles as a facility for golf outings, banquets and special events. 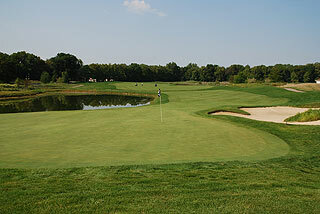 Callaway and Nike club rentals are available, as is golf lessons and instruction. On course golfers will find GPS mounted on each golf cart, 100, 150 and 200 yard markers posted on the fairways, plus sprinkler heads that are measured to the center of the green. The cart paths also have permanent yardage markers at 100, 150 and 200 yards. 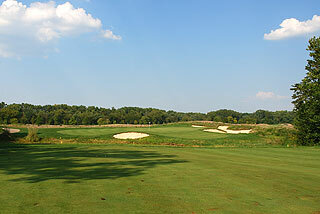 There are some gorgeous par threes at Prairie View, as witnessed by the photos of the 12th and 15th holes above. The four par fives are challenging, as they present tight approaches to green complexes guarded by trees, water or sand traps. Number 13 is an especially great risk reward hole as golfers have a choice of laying up safely to the wide landing area on the left, or going for the green in two by playing an accurate fairway wood or long iron over a water hazard to a green complex that features bunkering all around. 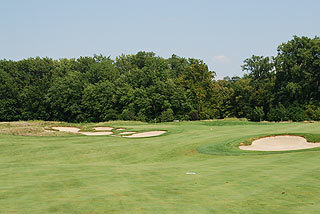 The front nine is quite open, with wide landing areas on links style fairways dotted with bunkers. 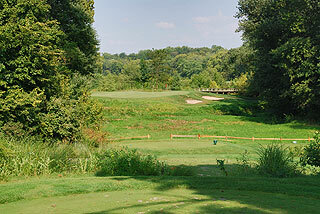 The back side presents a combination of links and traditional tree lines holes - some of which are tight off the tee. 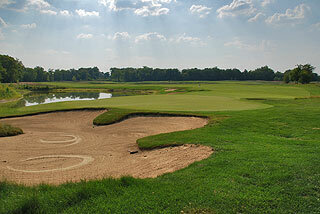 Bunkering is sometimes elaborate - with the par four 16th a good example. A plethora of sand traps encourages golfers to lay up off the tee, and the dry creek rock bed that crosses 80 yards out re-enforces this strategy. The view from behind the 17th green is special - with golden native high grasses accentuating the scene which includes a water hazard framing the manicured fairway and two tiered green. 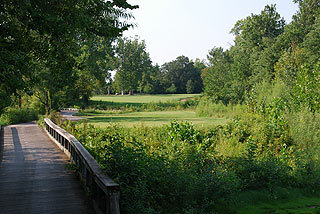 The par five18th is a great and interesting ending to a wonderful round - with a drive over a natural area on this dogleg right preceding play over or a creek that comes into play near the putting surface. These three form some great finishing holes! 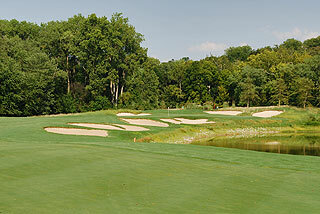 Four sets of tees afford golfers of all skill levels with an opportunity to choose a distance that fits their game. The tips play to 7073 yards with a 138 slope, while the gold tees also provide considerable challenge with a 134 slope from 6727 yards. 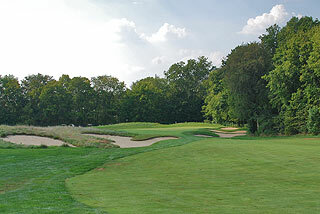 Alternate sets are more playable, as the white tees measure between 6215 and 6121 yards with a 125 slope for men and 134 slope for women, and the forward tees play to 5203 yards with a slope of 114 for men and 122 for women. We cannot recommend this course highly enough! This is an upscale experience on a wonderful layout with top notch service and facilities. 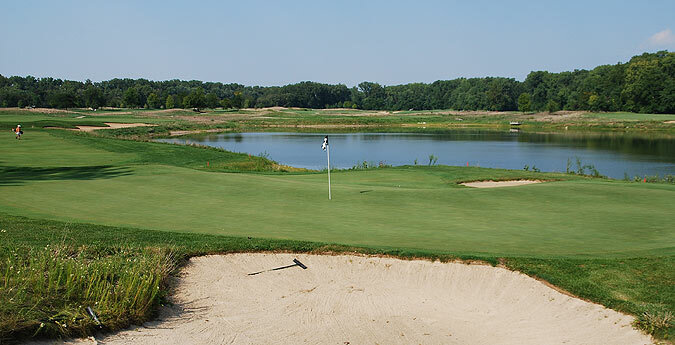 Play it once and you will want to come back...not too many courses like this one...for more info, visit our apge for Prairie View with direct link to their website by clicking here.